Being a transit/infrastructure/civil engineering buff as well as a long suffering resident of this traffic clogged metropolis, I’m always curious as to the status of different mass transit projects. 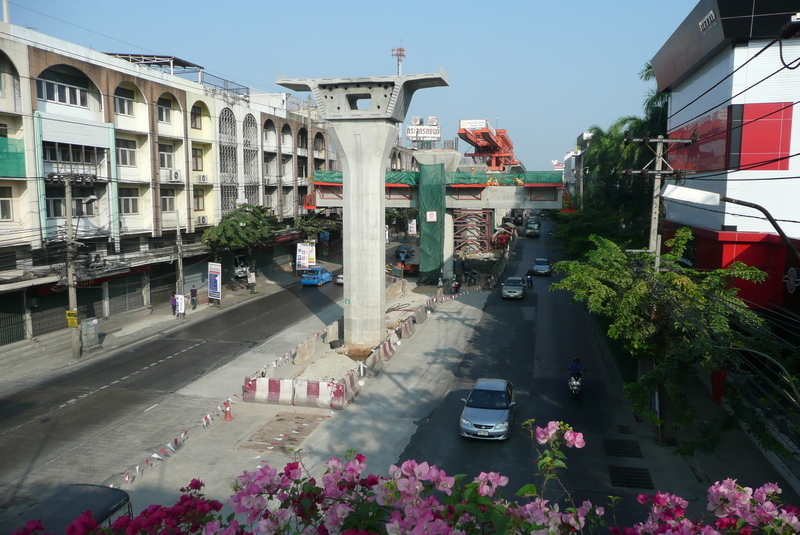 One of the two that I’m eagerly anticipating is the extension of the Sukhumvit Line of the BTS Skytrain. Sukhumvit is the main east-west running road in Krungthep. It changes names along the way, but it pretty much runs from the heart of the old city, through the Siam Square area, past the Asoke, Thong Lor and Ekkamai neighborhoods, before turning to the southeast and eventually – a few hours later – ending up in Pattaya. 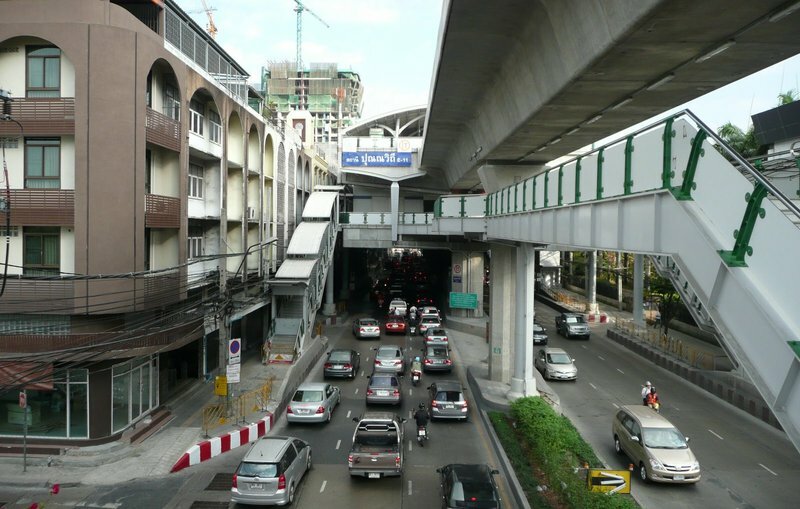 Even with the existing Skytrain line running to On Nut, traffic on Sukhumvit remains very heavy. Currently, an extension is underway that will take the line all the way to Bang Na on the border of Bangkok and Samut Prakhan provinces. There is an additional extension planned that will take the line well into Samut Prakhan and would help many commuters to reach the city. Earlier this week I was dropping our car off at the Nissan dealership at Sukhumvit 101 and I decided to snap some pictures of the current progress. It took me a while to find the previous pictures I had posted from the same spot. Of course the big question is, when is it going to open? It seems that the infrastructure is largely complete. According to reports, the delay in opening was caused by someone at city hall who didn’t process the paperwork to order track switching equipment. Pardon me while I roll my eyes. Meanwhile, after dropping my car off at the dealer, I decided to catch one of the dozens of bus lines running along Sukhumvit to connect back to the On Nut Skytrain station, which is the current end of the line. These busses do not have air conditioning, have wooden floorboards, and don’t quite come to a stop when picking up or dropping off passengers. At 7 baht (about US$0.21) they are a bargain, though. Thankfully, it was mid-day and there were few passengers. I was able to snag a seat beneath one of the oscillating fans. This entry was posted in Uncategorized and tagged Bangkok, BTS, infrastructure, Krungthep, Skytrain, transit by christao408. Bookmark the permalink. Chris, you are quite brave to catch that bus, as those bus drivers drive even crazier than the taxi guys! You must either be very short of baht on that particular day perhaps? Anyway, the fare used to be 5baht (a few years back), I guess inflation was the culprit! Do you remember when we were kids, the bus only cost 25 cents? I was shocked to see how much bus fare costs now. As a huge proponent of public transit, I’m always intrigued by MRT systems in other cities!! Our skytrain system in Vancouver is quite limited, too, but sadly our population doesn’t support something more extensive. I’m travelling to Hong Kong and Singapore in May so I can’t wait to see how their systems are!! @CurryPuffy – Well, it is the end of the month. Have to pinch those satang to make them last. @gweirdo – Our bus drivers must train at the same place as your bus drivers! They will regularly take up all three lanes when pulling over to pick up or drop off passengers. @arenadi – Yes, I do. In fact, during junior high school summers my friend Scott and I would spend the day riding around on the Santa Clara County Transit busses, exploring the whole valley. I think a day pass for youth was $1.25 or something like that. @lil_squirrel4ever – Vancouver has slowly opened up lines, though, and the new one to the airport seems quite handy. I remember when there was no rail there at all. You’ll love Hong Kong and Singapore’s transit systems – very convenient. Especially Hong Kong with the Octopus card! Buses don’t come to a stop when picking up or dropping off passengers? Do people just walk / run beside it? How do the elderly cope? @ElusiveWords – They do what I know as a “California Stop” in which the vehicle may slow down a lot and there may even be the most momentary sensation of no longer moving forward but just as soon as you recognize that sensation, it is already past. As for the elderly? Ha! They aren’t taking the busses here. For one thing, they would have to step off a high curb from an uneven sidewalk, into the street, up another high step to get into the bus doorway and then up two more steep steps until they were fully inside the bus. I can’t wait to see how the train station is going to look when it’s completed. I love public transportation. Wow. But I thought from an entry awhile back that you have choices of buses right? Some are nicer than others or are all on this particular line like that? You know, I do the same too! I look at the various Delhi Metro construction sites and keep wondering when it is going to be finished!!! The cash fare here is now $3. 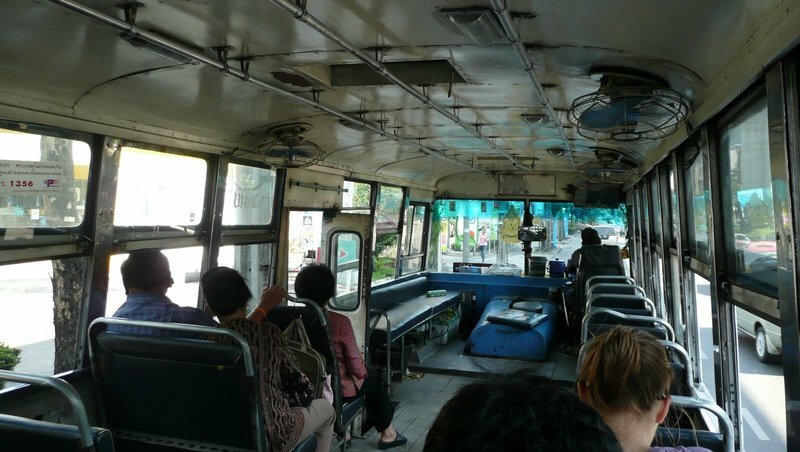 @yang1815 – There are different buses, yes, but along this point on Sukhumvit the options are mostly unairconditioned. Even the air conditioned ones are pretty old. @Dezinerdreams – It is these things that teach us infinite patience! @TheCheshireGrins – The new stations appear similar to the current ones but the roof actually arches over the entire track. Currently, the roof stops about halfway over the train cars, causing some splash-back when the rain is heavy. I guess not… arendi is that old?! @Wangium – He’s not old. He’s just very experienced! @Wangium – He’s older than you and younger than me. @yang1815 – He’s that, too. @Umnenga – I was just hearing a news story about new bus lines being started in Johannesburg, was it? Lots of controversy both about the black communities that will be connected to well-off white areas, as well as the existing informal transit.